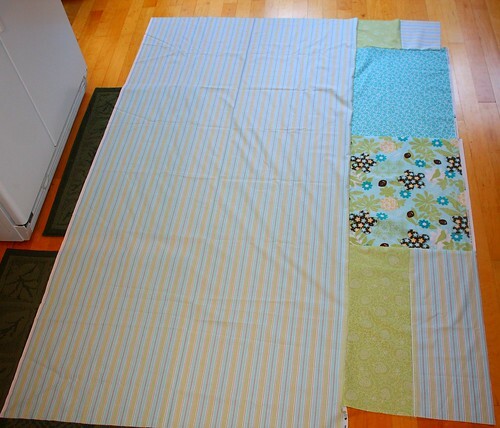 Stitches and Scissors: Flowers & Stripes quilt top done! Flowers & Stripes quilt top done! I decided to name this one Flowers & Stripes for the obvious reasons. I love it now that the top and bottom of the quilt are done. I had a hard time wanting to sew it together because I got a lot of new fabric for Christmas and wanted to start on that, but I am the type of person that has to finish what they started. I can't stop and go on to something else. I wish I could but it is just not in me. I should have ironed it, sorry. 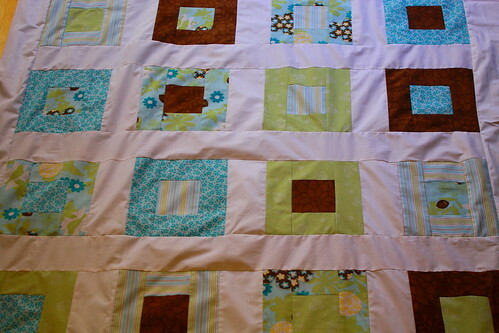 I pieced the bottom of the quilt with all the left over scraps and it was so fun, easy, and fast to do it that way. 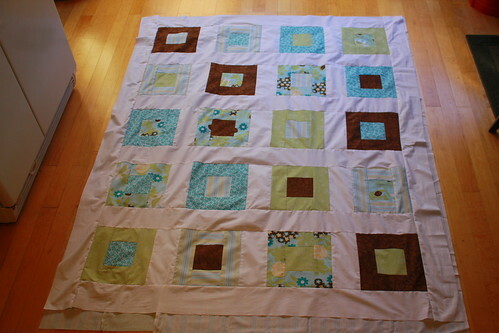 Now all I have to do it baste it, bind it (which I will do in the dark brown fabric), and quilt it. I am going to quilt this one more than I have before so wish me luck! I love it too! It looks great now that it's all together. I love all the white. How are you going to quilt it?? Well I was going to do free motion quilting but I don't think my machine will do that, I need to read up on it. I love the colors and patterns of this quilt. Good luck with the quilting part. Love the colours! Can't wait to see it finished. It turned out nice, I really like the colors together. Can't wait to see it quilted! I love it, that's beautiful! Great job, as always! Can't wait to see the finished product! I love this quilt! Those are my favorite colors! Your fabric choices work really well together.